A picturesque setting - enjoy peaceful mornings on the deck, overlooking a wooded backyard while sipping coffee. 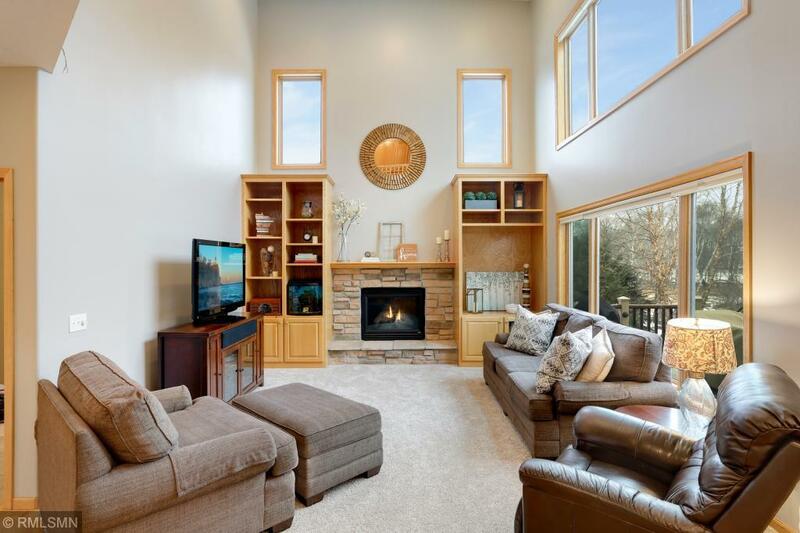 Relax by the fireplace in the great room, host dinner parties in the formal dining, and entertain in the walkout lower level, complete w/wet bar & amusement area. Other features include: high ceilings, bright windows, granite, & SS appliances. Front sitting room catches evening sun & executive office has double doors. 4 beds upstairs including owners suite! This 2-story has it all! The content relating to real estate for sale in this Web site comes in part from the Internet Data eXchange ("IDX") program of Regional Multiple Listing Service (MN) - Northstar MLS. Real estate listings held by brokers other than the website owner are marked with the IDX Logo and detailed information about each listing includes the name of the listing broker. The information provided by this website is for the personal, non-commercial use of consumers and may not be used for any purpose other than to identify prospective properties consumers may be interested in purchasing. Some properties which appear for sale on this website may subsequently have sold or may no longer be available. This content was last updated on 04/20/2019 12:00 All information is subject to change and is supplied by seller and other third parties and should be independently verified. Information is deemed reliable but is not guaranteed.